A regional daily’s commemorative football magazine has proved so popular that its print run has been almost doubled to cope with demand. HTFP reported in September how the Oxford Mail had produced a special magazine to mark the 125th anniversary of Oxford United. 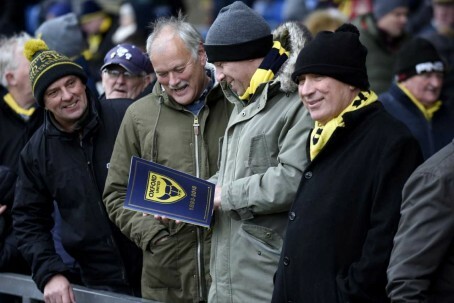 The 124-page publication went on general sale for the first time before the club’s 3-0 victory over Shrewsbury Town on Saturday, with supporters able to buy from five different stations at United’s Kassam Stadium home. The magazine was written and produced by Mail sports journalists Mark Edwards, David Pritchard and Jack Johnson, who undertook all of the work in their own time. Mark, who is the newspaper’s sports editor, said: “We are all delighted with the success of it all. “We worked extremely hard to ensure we produced something that every Oxford United supporter could enjoy and have been thrilled by the response. It seems to have gone down really well. “Our team of sellers, led by our marketing and promotions manager Jo Coady, did a great job on Saturday – at one point the queue was so long that we could not keep up with the demand. The production charts United’s history and features the big games, key moments and legendary figures, as well as a host of iconic pictures from the paper’s extensive archive. It also features an in-depth interview with the legendary Ron Atkinson, the record appearance holder for the club, who picks his all-time greatest Oxford XI. Well done to the journalists whose hard work in their own time made this publication a success. Given that the Oxford Mail might have made an unexpectedly decent profit from this venture I trust that members of the team “who undertook all of the work in their own time” will be properly rewarded for their efforts. Well done. Just hope the bean counters don’t moan about how much it cost to produce. This was journalism and PR in the best possible light which can only benefit not just the fans, the club, but also the paper.